Congratulations to the poster prize winners at ISACS 2017! 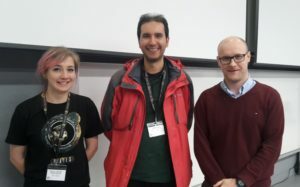 The latest International Symposium on Advancing the Chemical Sciences (ISACS) was held recently in Manchester, UK, and focused on Challenges in Inorganic Chemistry. The conference covered all aspects of inorganic chemistry, including organometallic, coordination, main group, bioinorganic, and materials chemistry, and boasted a great line-up of internationally-renowned plenary speakers. Professor Richard Layfield, Conference organizer and Dalton Transactions Associate Editor, presented poster prizes. 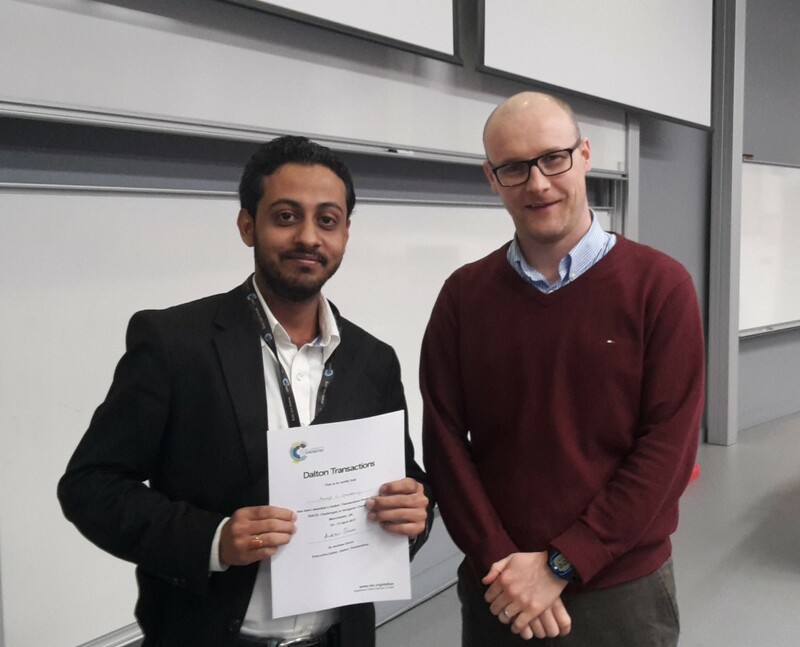 The winners of the Dalton Transactions poster prizes were Nikolaos Tsoureas and Monojit Ghosal Chowdhury. Nikolaos is a post-doctoral research associate, working with Professor Geoffrey Cloke at the University of Sussex, UK. He presented a poster entitled “Synthesis and reactivity of syn-bimetallic titanium hydrides“. Monojit is a PhD researcher in the group of Professor Sundargopal Ghosh at the Indian Institute of Technology Madras, Chennai, India, and presented a poster entitled “Electron precise diborane units stabilized in the coordination sphere of group 5 transition metals: A new outcome“. The winners are pictured below with a Chemistry World poster prize winner Jasmine Cross who is working towards a PhD with Dr James Walton at Durham University, UK. The 1st Applications of Photoactive Coordination Compounds conference, a preconference of the 22nd International Symposium on the Photophysics and Photochemistry of Coordination Compounds, will be held July 5th to the 7th in St Andrews, UK. The conference website is open for registration and abstract submission. Poster abstract submission closes May 1st, General registration closes June 2nd. Celebrate Canadian Chemistry with the RSC! To commemorate the 100th anniversary of the Canadian Chemistry Conference, and the 150th birthday of Canada itself, we’ve released a special cross-journal web collection that highlights the excellence and breadth of Canadian research. It’s free to access until June 18th and features papers in Dalton Transactions and twenty other RSC journals. It contains contributions from our Editorial and Advisory Boards, including Dalton Transactions Associate Editor Warren Piers, who also acts as a guest editor. 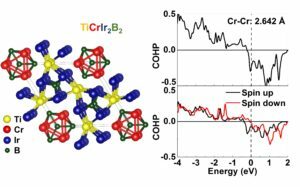 Left: Crystal structure of spin frustrated TiCrIr2B2 with Cr3 triangles and trigonal planar B4 unites. Right: No-spin polarized (top) and spin polarized (bottom) crystal orbital Hamilton population (COHP) curves for Cr−Cr interaction in TiCrIr2B2. Congratulations to the Poster Prize winner at the University of California Chemical Symposium (UCCS): Yuemei Zhang. Yuemei is currently working in the group of Boniface Fokwa at the University of California Riverside. Her poster was entitled “Magnetic Ordering, Frustration and Possible Spin Liquid State from 1D Cr3-Triangles in the TiCrIr2-xOsxB2 Series“. The meeting was supported by ten UC departments (UC Davis, UCLA, UC San Diego, UC Berkeley, UC Riverside, UC Santa Cruz, UC Irvine, UC Santa Barbara, UC Merced, and UC San Francisco). All areas of chemistry, including inorganic, organic, biological, analytical and physical chemistry were represented and the symposium provided an excellent opportunity for graduate students and postdocs to not only present their work in a multidisciplinary environment, but also take part in different workshops to further their career and establish connections with professionals from industry, government and alternative science jobs. The prize was presented by the RSC Editorial Development Manager, Americas, Dr Jennifer Griffiths. You are currently browsing the Dalton Transactions Blog blog archives for April, 2017.